Jordan Dane’s young adult novel Indigo Awakening introduces us to a complex and intriguing idea, bringing us the Indigo Children. During the 1970s, a pseudoscientific new-age theory emerged introducing the world to a new group of people. According to this new notion, children are born with unique and paranormal abilities and are considered to be the next stage of evolution in mankind – they are the Indigo Children. Jordan uses this set of ideas as the basis for her newest novel. Set in present day Los Angeles, seventeen year old Rayne Darby begins her story on a quest to locate her missing younger brother, Lucas. She struggles to know where to start, as all she knows is that Lucas has escaped the private mental hospital their older sister had him committed to after the death of their parents. Rayne has never recovered from the guilt she feels for allowing the committal of her brother to this hospital, and so sets out to find him. As she begins her search, the only thing that Rayne knows for sure is that she needs to trust her instincts and keep this quest a secret from her older sister, as well as from the adults who run the hospital. In good fortune, Rayne meets Gabriel – a tall, dark and handsome young man who, from the moment she lays eyes on him, evokes feelings of real love and safety. And, he isn’t your average boy… rather, he is accompanied by a ghost dog, screams silent rage and catches on fire. With an introduction like that, Rayne realises that she needs this strange and fascinating boy’s help to find her brother. At the same time, we meet a gang of teenagers living in the abandoned and forgotten underground of L.A. 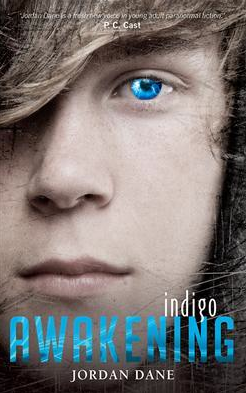 These are no ordinary teenagers, they have the ability to communicate telepathically – they are Indigo Children. Some have stronger powers than others but all are on a common mission to locate the many misunderstood Indigo Children to keep them safe from the “Believers”. The Believers are adults running a fanatical church, who spend their time hunting Indigo teens in order to run scientific and inhumane research, mostly involving tests on the brains of these children. The author of this book, Jordan Dane, takes the reader on an action-packed ride, building suspense throughout each chapter. She has created strong female characters, all of whom have a power over the males in their lives. She nurtures and grows each character so that readers will empathises with them in their struggle against a conspiracy-lead adult world. This novel is young adult fiction and I believe Jordan Dane beautifully describes the angst and fear that is associated with first love. She describes the transformations that the Indigo Children experience so vividly all while managing to let the reader know how these young adults are struggling with their own misunderstandings of their powers. I believe the author did a stellar job at knowing her market, making children stand together as one to fight adults in a very one-sided world. She also taps into relevant pop culture making reference to current music groups and comedy shows to engage her audience. Indigo Awakening is the first book in the “Hunted” series and can be read as a stand alone novel or as the introduction to a new series. Interestingly, Jordan Dane does what so many young adult stories do these days, ending the novel with a cliffhanger, ‘encouraging’ readers to buy into the franchise. Fortunately an excerpt of the follow-up novel is provided. I can see this story being made into a film with state-of-the-art special effects following the lead of other young adult franchises such as The Hunger Games and Twilight. Indigo Awakening is a good read and contains strong lead characters that may empower young readers to trust their instincts. Using the city of L.A. as the backdrop, this fast moving city symbolises the confusion that all teens feel at some point in their lives. I have read quite a bit of paranormal teen fiction in the last few months so believing in the powers of Indigo Children was not too difficult for me. For those who are new to this genre I do think Indigo Awakening might be a tad hard to get into at first, as the start of the novel introduces a large number of characters with little explanation of what motivates them. Perhaps this is the trick to Jordan Dane’s intrigue but I found it to be a little too rushed and had to force myself to sit down for a long period just to get into the story. However, if you love young adult stories or even paranormal fiction then I think you will enjoy this novel. Considering there really is a phenomenon surrounding Indigo Children I believe some readers will be enticed to learn more about this idea and the conspiracy theories associated with it.